HUMP DAY HOCKEY: Tonight marks the 10th of 12 meetings with the Gulls this season, and the final of six scheduled visits to San Diego’s Valley View Casino Center. The Roadrunners are playing a one-game road trip; they’re coming off of a 4-1 loss to the Grand Rapids Griffins on Saturday night. The Gulls are playing the second of a two-game home stand; they’re coming off of a 3-2 win over the Ontario Reign on Saturday. ONE MORE ON THE ROAD: The Roadrunners will play their final regular season road game tonight; the team boasts the second-best road record in the American Hockey League with a 23-7-2-1 mark and a .742 points percentage. They are 2-2-0-1 in four games played against the Gulls in San Diego this season. BREAKING THE LAW: Lawson Crouse, with points in each of the Roadrunners’ last five games, has been the hottest scorer for the team of late. He has six points (4G, 2A) during his current point streak. Back on January 15, Crouse registered a season-high three points in the Roadrunners’ 5-3 victory over the Gulls at Tucson Arena. PROJECTED LINEUP: The team held a morning skate at the Valley View Casino Center ahead of tonight’s game. Per club policy, specifics regarding the team’s lineup will not be published until 5:00 PM this afternoon. WELCOME BACK: The four players assigned to the Roadrunners on Sunday from the Arizona Coyotes: Dylan Strome, Trevor Murphy, Dakota Mermis, and Joel Hanley, are expected to be back in Tucson’s lineup tonight, and will be with the team throughout the playoffs. 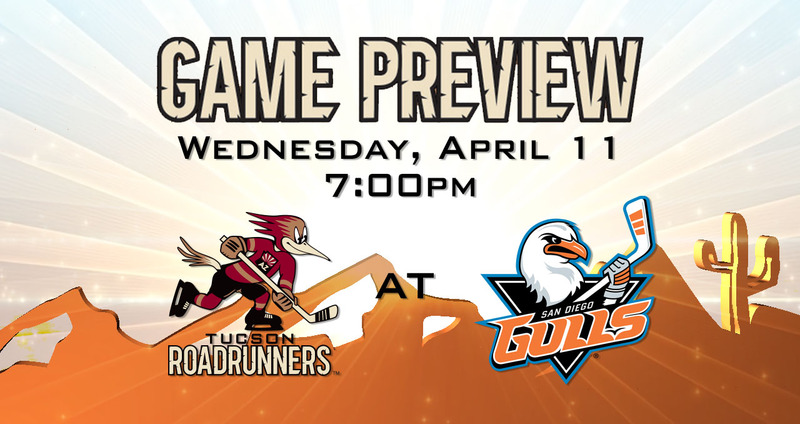 THE LAST TIME AROUND: In the teams’ previous meeting on February 3 at San Diego’s Valley View Casino Center, the Roadrunners fell to the Gulls by a 4-1 score. Mario Kempe scored Tucson’s lone goal in the first period; San Diego responded with four unanswered goals en route to victory. Hunter Miska stopped 32 of the 34 shots he faced in the loss. THE DEAL WITH DYLAN: Dylan Strome will play in his first game with the Roadrunners since March 17 after playing 10 games with the Arizona Coyotes during his most recent NHL recall, where he produced at an impressive rate in registering eight points (3G, 5A). In seven games played against the Gulls this season, he’s totaled 12 points (6G, 6A), including four multi-point performances. Can Strome continue to pester the Gulls offensively tonight? I-8 BORDER TROPHY: With a 4-4-0-1 record against the Gulls through nine games, the Roadrunners are currently behind in the race for the I-8 Border Trophy – which was introduced prior to the season. The winner is based on total points earned after the teams' 12 regular season match-ups. 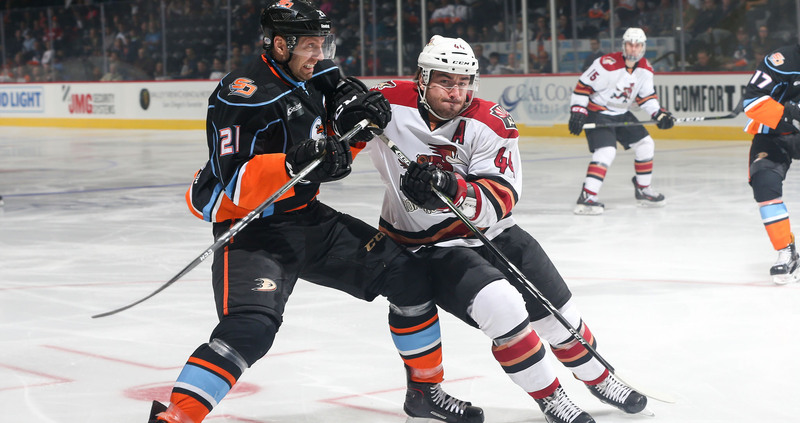 Entering the night, the Roadrunners trail San Diego by a 10-9 count.